The other night I was outside and could smell someone grilling something and wham! I wanted a burger. I think smelling meat cooking on a grill is a lot like smelling popcorn. You didn’t really have any urge to have it, until the smell wafted over to you. Burgers are fairly common at our house because they are quick, don’t take a huge amount of effort, and we almost always have the 3 essential ingredients (meat, buns, cheese) on hand. Those three ingredients are the jumping off point; from there we put on whatever is available and tickles our fancy. In all honesty, I don’t think we’ve eaten the exact same burger more than twice. As I was starting to caramelize the onions I realized that I have never posted a single recipe on here for a burger. So I decided to change that! 2. Once your burgers are formed, season them any way you like. I sprinkled ours with a little garlic powder, onion powder, season salt, and black pepper. 3. Heat your grill to high and place burgers on when ready. Cook to desired temperature. About 10-12 minutes for medium, it will depend on your grill’s temperature. When you have about a minute left add your cheese to the top. If you want your buns heated or toasted, add it at this time as well. Be sure to keep an eye on them! Once cheese is melted and buns toasty, remove from grill. 4. 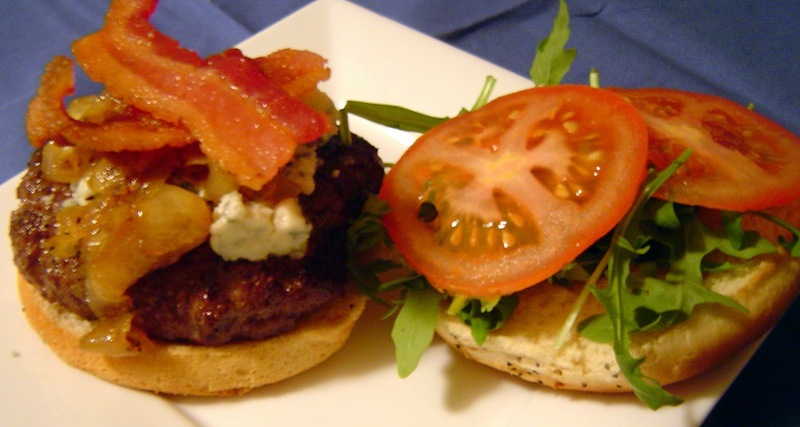 Top burgers with even amounts of arugula, onions, bacon, and mustard. Serve and enjoy! Thoughts: Where do I start? These guys have a LOT of flavor going on! Each element worked perfectly in sync together and the burgers were juicy and held up nicely to the toppings. The arugula and mustard gave them a kick, which the sweetness of the onions play off of nicely. And you got a nicely salty element from the bacon and bleu cheese. Perfectly balanced all around. I loved every bite. *A Tip on Burgers: One thing that we have found to be really helpful is to buy a large amount of ground beef, take it home, form some patties, and freeze them. When you form the burger, try to make it thicker on the outside with a little indentation in the middle. 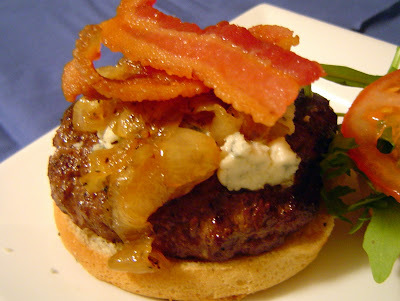 Burgers plump when you cook them so this will help your burger obtain a “flat” shape when it’s done. Also, I don’t season them before freezing because I don’t like the idea of “committing” to any sort of flavor in advance, but you can if you wish. To freeze them we just place two burgers flat in a freezer bag, remove as much air as possible, and lay in the freezer flat until frozen. Just take them out when you need them and allow to thaw. What are your favorite burger toppings? I love finding new and exciting ways to top a burger! I just signed up to follow your blog. I love all of the creative recipes you have posted and I look forward to seeing more of them. I just added you to my blog roll. I hope it gets you some traffic! Thanks for the tip about flattening the middle. I've never thought about that! And I love bleu cheese on my burgers. I love your analogy about the burger smell and popcorn smell. It is so true!